The Lunar Eclipse of 31st January 2018 lasted 77 minutes. As my previous post was about the number 7, and specifically the association between 7 and idealism, i decided to see if i could find any idealistic aspect to this Full Moon eclipse. In fact I was pleased to find, not one but two strong associations, one personal and one public. I also had fun deepening my understanding of the lunar cycle and the Sabian Symbols of astrology. Here is my journey. Have you heard of the Sabian Symbols? They are a set of 360 images, each representing one degree of circle of the heavens around our planet. These symbols were intuited in 1925 in a particularly intense process in which images were received in a random order. one image per minute over a period of one day. They are considered to have come from the time of ancient Chaldea / Mesopotamia and they add a layer of richness to any astrological chart. I find them very interesting and often refer to them. In any moment every planet will be located in one degree of the circle of the zodiac. Referring to the Sabian symbol associated with this degree will introduce rich ideas for interpretation of the potential of that planet's influence in that moment. In considering the message of this eclipse i have looked at the Sabian symbols for the placement of both sun and moon on 31st January, the day of the Full Moon eclipse. The story begins though on the 17th January. This was the New Moon day, the moment when the sun infused the moon with the seed of this month's potential. It is a potential which has been growing through this lunar cycle ever since. The Sabian Symbol for the Sun Moon position of this moment will give us the theme of the seed that will grow. On 17th January the sun and moon sat together in front of the 27th degree of Capricorn. The Sabian symbol for Capricorn 27 is "Pilgrims climbing the Steep Steps leading to a Mountain Shrine." It suggests a journey upwards, perhaps challenging, and probably towards some noble goal. I was impressed when realised, writing this article, that i posted my previous article "The Ideal 7" on this very New Moon day! It is a perfect fit. The goal of my new diet, to reach my ideal shape, is surely some kind of shrine at the end of a journey. And the steep steps fit well with the effort of will i must make from time to time as i lift myself out of the bad habits of the past. Sometimes it really is a case of just make the next step - he right choice in this moment - just as if i were climbing a mountain. The other very interesting thing here is that it was this article on The Ideal 7 that made the 77 minute duration of the eclipse significant to me. I would not have written this article now for the Full Moon if I had not written that article at New Moon! The energies of conscious (sun) and sub conscious (moon) which were joined at New Moon now begin to weave together as the month unfolds. Learning experiences based around this theme begin to be created as the month progresses. The first quarter of the moon marks the incubation and emergence of the theme, in the second quarter the theme is developed and reaches full flowering by the Full Moon 14 days later. Let us now look at the Sabian symbols for the Full Moon. This shows how the theme of the original seed had now developed. time we have two to consider. Sun and Moon are no longer sit together in the sky, by Full Moon they face each other across the sky and we are given a symbol of reach. The picture becomes more complex. By Full Moon the Earth has moved on a further 14 degrees around the Sun. Now the sun appears in front of the 12th degree of Aquarius. The Sabian symbol for this degree is: People on a vast staircase graduated upwards. What an interesting continuation of the "journeying upwards theme From "Steep stairs to mountain shrine" to "vast staircase graduated upward " both have the direction of up. Yet there is also a difference of atmosphere between the two. The steep climb of the pilgrim has opened out into a wider staircase. A staircase feels more spacious, it allows more differences in the path of ascent, people may pass each other, travel faster or slower, go at their own speed and to their own ability. A wider perspective and more freedom becomes available on the vast staircase. We can see other options, our position relative to others in a way that a pilgrim following a narrow path could not. Our ideals, our goals, the things into which we put effort in order to achieve something valuable are many and varied. My choice to improve my diet and health is just one of many possibilities. What are the ideals to which you aspire? Culture, family and society will have many suggestions for us but only you can know which truly fits you. In the end each of us alone is answerable for our own choices and experience. Life is a journey. What is a worthy destination for us to journey towards? My first thought is what an ideal opportunity to view the lunar eclipse. We will be standing under the moon, bathing in its light and message. What is being stimulated? What are we discussing as we gather together at this adult occasion? Perhaps our position on the staircase? How are we doing relative to others. Wha goals should we set? What shrine is worthy of our commitment? Before we can make a full assessment of the opportunity of this lunar eclipse we should take a moment to consider the general effect of lunar eclipses. I believe they are different from solar eclipses in an important way. During a solar eclipse the moon passes in front of the sun and temporarily blocks the consciousness / light of the sun from reaching Earth. The solar eclipse creates a moment of unconsciousness. 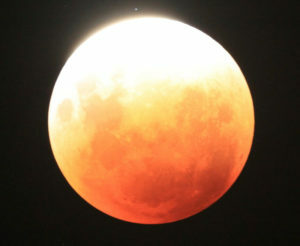 During a lunar eclipse there is a different dynamic. It is the Earth which passes between sun and moon. The moon however does not disappear. Instead it turns red. The slower wavelengths of sunlight, the reds and oranges, are refracted by our planet’s gravitational field and are focused back in towards the face of the moon. This suggests to me that the field of the Earth’s collective consciousness becomes a temporarily active ingredient in the moon shine. It is as if a homeopathic dose of our own current consciousness is added into the process and creates a new intensified opportunity for understanding at the very height of the process - the Full Moon. In Aura-Soma terms we could liken it perhaps to the benefit of shaking our Equilibrium bottle before applying in order that the effect of the oils are fine-tuned to our own energy and therefore potentially more effective. We are each on the stairway. We are each at the party. We are each making our own journey upwards with as much integrity as we may. And together we are experiencing the sum total of collective consciousness on this subject. Very specifically so at the moment of the lunar eclipse as the moonlight is tinged with the light that has been refracted through our own atmosphere. Now comes the exciting part. Here is an example of a real world event which has been unfolding during this lunar cycle. I believe it is a perfect expression of at least one version of this month's energies. As the Lunar Eclipse approached there was a fascinating interview which was going viral on the internet. Recorded on 16th January, the day before the new moon emerged, by the time of the Full Moon it had been viewed more than 5 million times. When we add in the dozens, if not hundreds of further media discussions commenting on this interview: on Twitter, on Youtube, on websites and in the the British newspapers, then clearly this has been an event of significant impact on general consciousness these last two weeks. This interview was between a UK news presenter, Cathy Newman, and a Canadian Professor, Jordan Peterson. The subject was the the fact that men, on average, earn more than women- the Gender Pay Gap as it is called. I think that pay, and the subject of our work or career to which our pay in linked, is a perfect "material world" analogy for the upward journey. During our lifetime we make our way up through office and professional hierarchies. Our pay should be a reflection of that progress. This subject is further suited to this lunar cycle since the New Moon was born in Capricorn, the zodiac sign which is most often connected with work and career. Though it is hard to see in the picture above, there is a strange image as the backdrop between Newman and Peterson. It is a photo of a classroom taken from above. Because of the way the picture is displayed it portrays people facing upwards. There could hardly be a better abstract representation of people making an uphill journey than this! One thing that strikes me as i look at the journey from New Moon to Full Moon is the way that the solitary nature of the pilgrim's individual journey has been replaced by a collective dimension when we reach the Full Moon. It is implied by the Sun's "People on ..." and also the Moon's "... Lawn Party" This opening into the collective level is reflected well in the subject and circumstance of the interview. Firstly because the detail of the interview - the question "Do men earn more than women?" - requires everyone's individual pay to be included in the calculation. The question of where you are on the path towards your own goal is no longer as important as the question of how you are doing compared to those around you. The "vast staircase" the symbol of the Sun's position allows comparisons to be made in a way that the steep stair of the mountain path did not. The individual nature of our pilgrimage through life made as a matter of personal integrity is now looked at by the measure of collective considerations - how do your earnings compare to those around you? . Secondly, the fact that the interview has gone viral on the internet also fits with the collective element in these two Full Moon symbols. 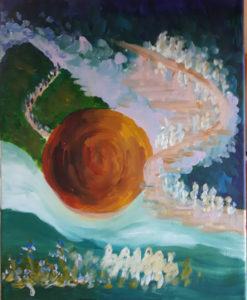 "Journeying upwards" has been brought into the wider collective domain. The sun symbol “many people ascending a vast staircase” matches well with the subject of the interview. It is a great metaphor for the progress people make as they rise higher in status and wealth through their life. The moon symbol. “an evening garden party” matches well with the effect of the interview - the coming together and conversations which have been stimulated by the interview. In a broader sense th garden party could be the entire collective consciousness. The original stimulus to write this article came when I noticed that this January 2018 Lunar Eclipse would last 77 minutes. This was an interesting fact given i had just written about " The Ideal 7" As I began to research the lunar eclipse however i found more and more richness in the Sabian Symbols interpretation. So much so i began to wonder if i would be able to find anything for the 77 after all. Now i come to write this I have just one thought, somewhat playful, about 77. I wonder if the 77, two 7s, can be taken to represent man and woman respectively, one 7 each for our 7 chakras? The interview was based on a male / female comparison and the interviewer was keen to emphasis the divide between men and women. 7 and 7 separate. Nevertheless through the interview Peterson was i think successful in showing that the pay gap depends on many factors and choices, and that gender, whether we are male or female, plays only a small role in determining the amount of money we receive for our work. The 7s need not be in conflict. This conclusion brings us back to the deeper New Moon theme. namely that our success or otherwise on our journey upwards depends more on what lies within us than in our outer circumstances. Maybe the goal as the soul makes its pilgrimage through life is to integrate the male and female, the 7 and 7, better with ourselves. As a human being the size of our salary may not be the best measure of our success. We are all on a journey. We travel side by side through life, yet we each have our individual goals and values. Our relationship to the shrine, to the sacred at the end of the mountain pilgrimage, is the deeper guide and it will be the true measure of our success on the path. This post began when i heard that the January Lunar Eclipse would last 77 minutes. I wanted to see if there would be a connection between my newly discovered association of idealism in relation to number 7 and the theme of this lunar cycle. The theme of mountain pilgrimage - finding a way to elevate oneself - was a good beginning. As the days of the waxing moon unfolded, the Channel 4 interview on the gender pay gap began to focus attention on an aspect of the upward journey in this material world. By the time of the Lunar Eclipse at Full Moon the elements of the story were clearly apparent. On the side of the Sun the ascending staircase on which we all find our place. On the side of the Moon, the evening garden party where as adults we can reflect upon and discuss this question of our upward journey. The 77 neatly references the male / female dimension of this question. As we now enter the waning period of this lunar cycle we can benefit from a maturing of these themes. I have further ideas to share with you which have been stimulated since the Full Moon. Watch out for my next post. Subscribing will ensure you are always kept informed of any new posts. The interview is a really impressive example of how to succeed in a discussion when there are strong collective energies operating beneath the surface. This is something i did not mention in the article above but it may well be another aspect of this lunar eclipse. The interviewer Cathy Newman clearly has an agenda, an emotional attachment to a point of view she wants to defend. It was these underlying dynamics that were so stimulating to us watching from the moonlit garden party as we contemplated how we ascend on the staircase of work and its rewards. commissioned the creation of the Sabian Symbols. © Dominic Yeoman. All rights reserved.